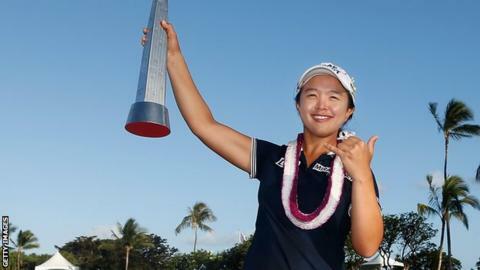 South Korea's Kim Sei-young chipped in to force a play-off and then holed from the fairway for an eagle to win the LPGA LOTTE Championship in Hawaii. The 22-year-old led by a shot into the final day but found water at the 18th, leaving Inbee Park with a putt to win. Park's birdie effort stayed on the edge and Kim chipped in from off the green for a par to match her at 11 under. Back at 18 for the play-off, Kim's eight-iron from 154 yards just cleared the water, bounced twice and rolled in. Kim, who claimed her maiden LPGA title in only her second start as a tour member at the Pure Silk-Bahamas in February, is the first player to win two titles this year. Defending champion Michelle Wie closed with her second successive 73 at the Ko Olina Golf Club to finish in a tie for 11th.